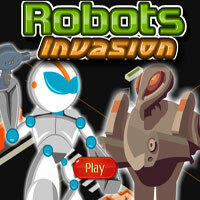 Description Aim, shoot and kill all the enemy robots and also their king before they reach you to complete a level. If they reach you, your health decreases. Attacking them gets you points. Have Fun shooting them!! Controls Use arrow keys to move and space bar to shoot.